The planning commission meeting on the Mathis Airport rezoning has been delayed two months; one for a lack of quorum during the holidays, the other for the Snowaggedon we had here in January. Engineering drawings for the dismantling and reassembly are well along, with the new roof trusses designed where needed for the much larger hangar, but until formal notification that the airport is closing occurs, no concrete steps will be taken to move the hangar. Work this winter has focused on the ring spar, which goes around the 10’ diameter ducted fan, and carries all the structural loads imposed by the wings. 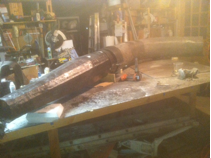 This work has included making two new transition pieces where the 12” diameter ring spar transitions to a 6” diameter spar, and completing the layups for the ring spar sections. The method for attaching the seven sections of the ring spar to each other has been worked out. 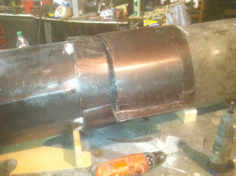 The rough ends of the sections are glue sleeved with perfectly round half pipe sections of an exact outer diameter. These sleeves are then clamped together with a two part outer sleeve, whose inner diameter exactly matches the outer surface of the inner sleeves. This process is in progress; it takes seven sets of the outer sleeves and a total of 28 of the inner half sleeves. These are made one at a time in an aluminum mold, so the making of all the outer sleeves and inner sleeves has been quite time consuming. 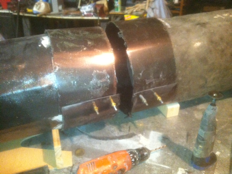 The previous pictures show the outer sleeves prior to the substantial buildup of extra layers of carbon fiber and Graphlite to be added, which are needed to carry the required loads. 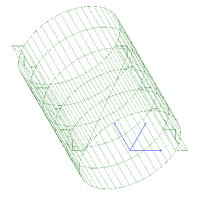 Finite element analysis is being used to determine the amount of extra layers required.The good news is that once the sleeves are made, the assembly of the ringspar sections goes pretty quickly! This photo shows a trial fitting of one of the transition pieces to the left front elbow of the ring spar. 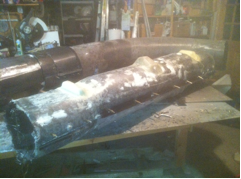 Both parts together weigh about 30 pounds, and are two of the heaviest all carbon fiber parts on the Jyrodyne. This shows the main passenger compartment spar carry-through, which connects to the ends of the two 12” ringspar elbows. Right now it is in two halves cleco-ed together, with some surface treatment work in progress. The untrimmed end on the left will be cleaned up prior to final assembly.